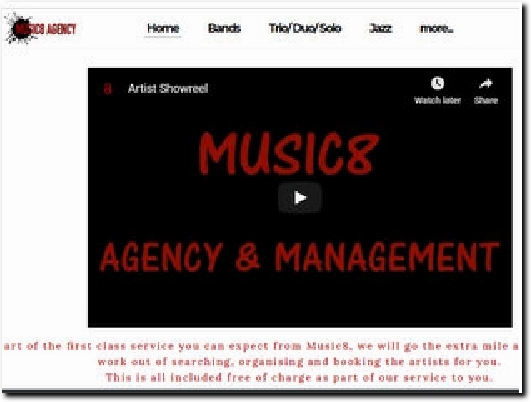 As part of the first class service you can expect from Music8, we will go the extra mile and take the hard work out of searching, organising and booking the artists for you. This is all included free of charge as part of our service to you. For special events, live music is a wonderful entertainment perfect for weddings. Our talented and varied artists will add sparkle to any event, catering for all music tastes, with their proven track records with great reviews, it"s a little wonder they are booked over and over again. 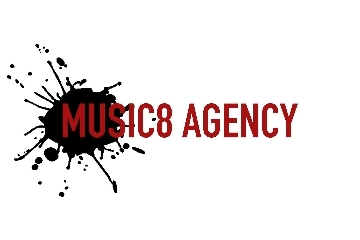 At Music8, we understand searching the net is exhausting, so we save you the time and added pressure of checking out each artist"s credentials. In the unlikely event something unforeseen should happen, we have backups and you can be assured we will do everything possible to make sure your event goes off without a hitch. A music agency with a wide range of performers available to book for weddings, parties and corporate events. Select the type of act you want from the Home page and then select a band from their photo. This leads to information on the act, a video link and their playlist. Contact has phone an e-mail details, while Blog has useful information if you are thinking of hiring a band.